We all love the pace of a baseball game and we end up loving a team, a player and decide to carry on with our fanatic nature. It is seen a number of times, a favourite player of yours got overwhelmed with the cheer and support he got from your end and finally rewards you with a baseball bat, specifically the one he has been playing with. So you know how special and close it is to you and your heart. As a result, you choose to keep the bat in right conditions and display it with pride and vigour. 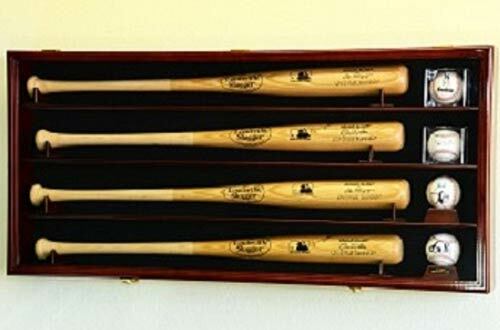 There are a lot of baseball bat display cases available out in the market and each one of them are supposed to add an extra bit of elegance to the bat. But, due to the overflowing number of models and manufacturers, people often end up choosing the wrong display case for that special bat. 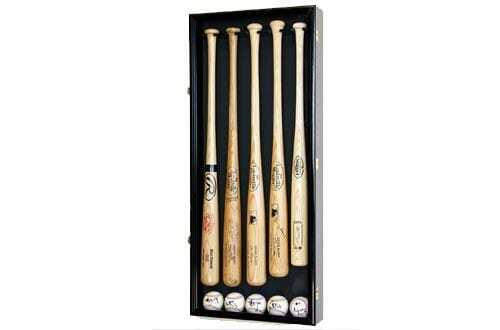 Well, you can save yourself from making the horrible mistake, as in this article we have shortlisted a total of 10 best baseball bat display cases, carefully narrowed down keeping every detail in mind. Go ahead and give it a read to choose the right model. Keeping the baseball bat in this display gives it the right kind of stature it deserves and makes it even more elegant looking and all the more attractive instantaneously. The SFDisplay-Baseball bat display comes in a simplistic design with 98% UV protection and an ultra clear acrylic door that showcases the bat in the right way. Also, there is a black fabric in the background, which creates a great contrast with the bat and the ball. The Australian beech wood construction with solid brass hinges makes it extremely durable as well. Can accommodate bats up to 36” and even a baseball. Comes with lockable latches and keys. Easy mounting with all the required hardware and can be mounted in any direction. 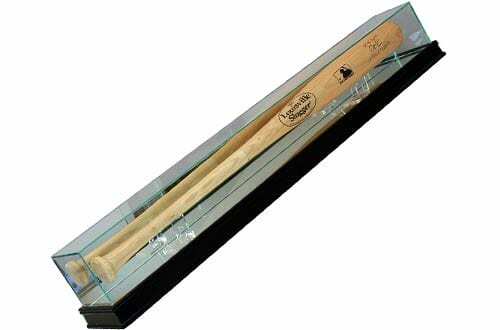 It is time you keep that collector baseball bat in the right place; keep it protected forever and make it look classy as well. 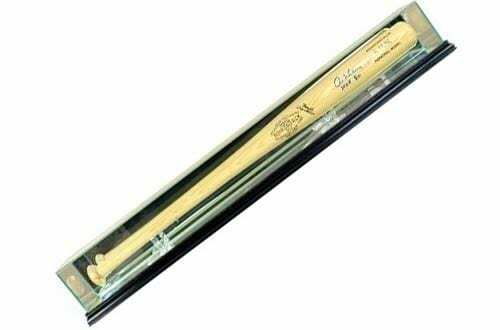 This tabletop baseball bat display is an outstanding model to keep that special bat in perfect condition as it comes with real UV protection that will make the bat stay new forever. 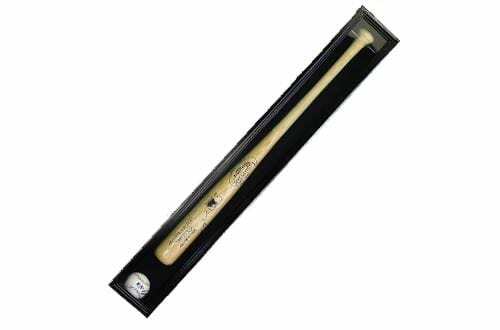 Moreover, you get the benefit of real wood moulding and it is finished with a non-acidic adhesive that protects the signature on the bat from fading. Two clear acrylic bat holders to keep the bat in either direction. Large size perfect for bats up to 36-inches. If you have got hold of more than one of those special baseball bats, then this model is undoubtedly a suited choice for you. It can accommodate up to 3 baseballs and 3 bats and looks quite elegant as well. The furniture grade beech hardwood construction is finished with an elegant touch, making it look extremely appealing apart from providing high durability. Furthermore, there are brass hinges and a black felt fabric that combines together to make it look gorgeous. It comes in one piece and requires no setup. Features a 98% UV protected the acrylic door. The display comes with installed lock and keys. Able to hold bats up to 38.5” long. The wall mounted display case from Perfectcase is designed in a different way to make the special baseball bat even more attractive. It comes in a wall mounted design and is finished off with a UV protected glass case that ensures the colour, as well as every detail of the bat, remains new forever. It is made in the USA, so you get the best in terms of quality and real wood moulding construction ensures longer life of the case. It will keep the bat and ball forever new and shining. Non-acidic adhesive to keep details and signatures alive forever. Do you have a couple of special bats from your favourite players? And you want to preserve it forever? Do not worry as the SFdisplay model can hold two of those beautiful looking baseball bats with sheer elegance and class. The 98% UV protection on the door will keep it real and appealing forever while the ultra clear acrylic door can display even the slightest details with ease. Besides, you get a fully assembled package which makes your job of mounting easier. The solid Australian beech wood construction combined with brass hinges add to the durability of the case. It comes with lockable latches and keys. Comes with black or red background, making your bat more appealing and elegant. Can hold 2 bats and 2 baseballs. 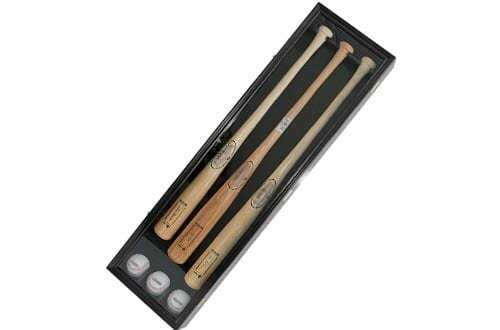 SFdisplay is a reliable name that has been producing display cases for those collector editions baseball bats. These display cases are designed with excellent quality and construction meant to last for years without any issues. The 5 bat display case is handcrafted with beech wood and it is completely elegant. Furthermore, you get heavy duty lockable latches with keys meant to keep those memories safe and secure. Has a 98% UV protected Plexiglas door. Can accommodate 5 full-size baseballs and bats. 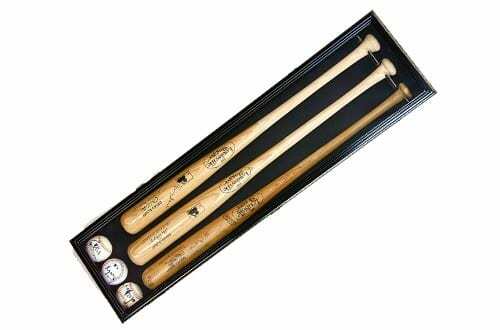 The more you have, the more you can store as the 4 baseball bat display case from the house of SFdisplay is undoubtedly one of the smart choices to make when you collect as many as 4 of those special bats. Keeping those bats in a case make them look compelling and also assure that they will be at your home or office forever. This display case comes with lockable latches and keys so that you can keep them safe forever. The felt fabric background blends to reward you with a stunning display while the 98% UV protected acrylic door keeps fading away. It can easily hold 4 bats and 4 balls. Provides accommodation to bats up to 40 inches. Fully assembled for required mounting. 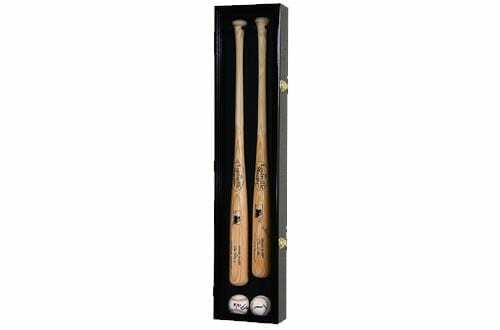 The Perfectcase model of glass baseball bat display case packs an amazing design that will showcase the memorable baseball bat for you in the most outstanding fashion. 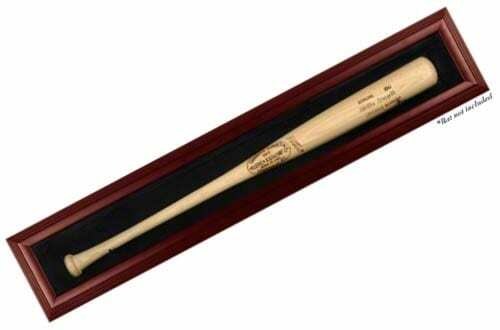 It creates an attractive and appealing outlook as the glass case is crystal clear meant to show off even the little details inscribed on the bat. Moreover, inside the case you get lifts off the base which is made of glass which guarantees a commendable display. The included clear acrylic holders make it easier for you to store the bat without any hassles. Comes with highly contrasting black colour sports moulding to create more appeal. This is undoubtedly one of the most premium looking display cases in the list as it is constructed out of 1/8” thick acrylic wood and finished with a mahogany wood frame with utmost care and precision. Now you can display your collector’s bat with unmatched class and give it the stature it truly deserves. Also, in the back, you get a black acrylic finish that looks extremely contrasting and brings out the real colour of the bat. Both walls mountable and can sit on a table or countertop. Mahogany wood construction, adds to the durability. 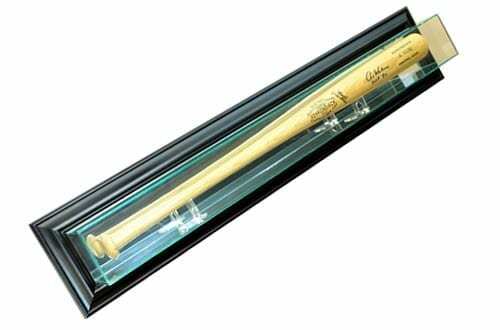 At the topmost spot of the list, you get the trust and reliability of a display case that is manufactured by SFdisplay, one of the most popular baseball bat display case makers. It offers an exceptional 98% UV protection to save the details, colours and signature from fading away. Furthermore, the case is made out of solid Australian beech wood hardwood that makes it highly reliable in terms of durability. And last but the not the least, you get a complete package consisting of all mounting and assembly requirements. Black felt lining which is acid-free, brings out every detail and colour. Comes with keys and lockable latches for security reasons. It can hold up to 3 bats and 3 baseballs. Your favourite baseball bats will now have a new address, i.e., an excellent baseball bat display case. It will not only protect your priceless possession well but will also help to flaunt your collection.